While this year's Edinburgh International Festival east-meets-west theme primarily engages the metropolitan cultural consumer, there is a secondary agenda that involves audience development among Edinburgh's and Scotland's minority populations. It'll take something rather more scientific than one pair of bespectacled eyes to assess the progress being made, though there have been encouraging signs, notably at the qaatsi trilogy and the Seoul Philharmonic. More interesting, though, is to reflect on the nature of 'audience' in relation to this issue. Whereas the Western style of concert-going revolves around a bunch of people agreeing to be in the same place at the same time, different temporalities are in play in these forms of music-making. A sense of place and time is more intimately bound to the act of performance, and, in consequence, the translation to the clock-bound Western mode introduces certain dissonances. 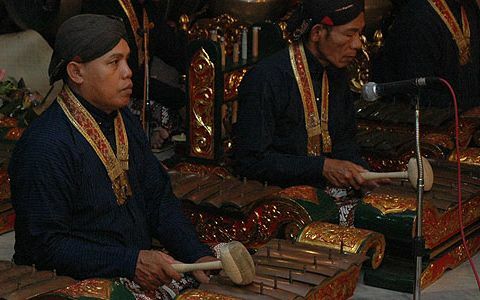 For instance, the Yogyakarta Palace Gamelan Orchestra was palpably nervous during the first of the items they presented. Nothing to be ashamed of, of course, but still something of a surprise given that the ensemble is accustomed to the aristocratic surroundings of the Sultan's palace at Yogyakarta. Once they hit their groove, a delightful paradox emerged between the vivid, clangorous sonorities of their distinctive tradition, against the meditative tranquillity embodied in the music's structure. The bells and gongs are much more to the fore in this style than in the more familiar wood-infused gamelan timbres featured, for instance, by the ensemble that accompanied one of Mark Morris's Festival performances a few years back. Speaking of dance, the group brought two dancers—male and female—but alternated them between performances. At this performance, Putria Retno Pudyastuti danced Tari Golek Lambangsari. Richly costumed, even more so than the musicians, at times she floated with exquisite grace in swift, birdlike swoops. At rest, her finely-tuned hand and head gestures melted into the continuum. Intriguingly, the east-meets-west theme turned on its head in the penultimate number, 'Gendhing Westminster'. Composed by Raden Wedana Larassumbaga, the title reflects his being inspired by the sound of Big Ben at Westminster, which he heard—presumably—on the radio. Because the bells' tunings are so distinctively Javan the result is not kitschy, as one might fear, but rather disconcertingly familiar-yet-unfamiliar, the regularity of metre perhaps being more unexpected than the melodic relationship with the chimes. 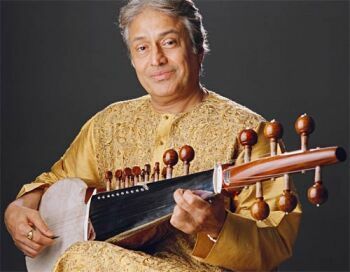 Amjad Ali Khan expressed his pleasure at having the opportunity to perform morning ragas, in the course of introducing his selected repertoire at the Queen's Hall. In India as in Britain, concerts normally happen in the evening. He explained something of the conventions that attach certain ragas to certain parts of the day, in terms of their attunement to the climate outside, and its influence on the mood of the performers and listeners. It is one of the mysteries of the raga, which remains an elusive concept to explain: more than a mode, and more than a set of instructions, yet less than (or rather, distinct from) a completed composition. Khan's instrument is the sarod, resembling a fretless lute with a set of sympathetic strings. It is played with a plectrum while the strings are stopped not with the flesh of the finger but the fingernail, giving the sonority a brilliant sheen and allowing the player to create melodic lines that closely resemble the North Indian vocal style with all its complex sliding inflections. Indeed, Khan talked about 'singing through his instrument', and frequently, in addition, broke into song. Several of the ragas he performed divided into three passages, with the central passage being vocal; it was fascinating to watch as well as listen, and observe the hand gestures that significantly amplified the communicative intent of these. Joining Khan was tabla player Satyajit Talwalkar, demonstrating an eloquence through his hands of an altogether different kind; at times it seemed as though he was sustaining two entirely different patterns with his two hands in a gently brilliant counterpoint to the sarod's elaborate melodic invention—and that is without the expressly virtuosic flourishes with which the two men typically concluded each raga. The ingredients in The Legendary Music of Rajasthan (a region bordering Pakistan in north-west India, and neighbouring Amjad Ali Khan's native Madhya Pradesh) were outwardly similar: a small stringed instrument played by a musician who also sings, and a drum. However, the differences were striking. The word 'legendary' turns out to have an inflection quite different to what one might initially imagine: meaning that rather than focusing on the identities of individual performers, these musicians' practice actively contributes to the making and preserving of oral tradition. Whereas Amjad Ali Khan vocalised on solfège syllables, these singer/storytellers were engaged in narration. The presentation featured three principals representing three traditions, each of which weave complicated relationships of mutual obligation between patron and performer into the fabric of the material performed. Representing the Manganiyar tradition, Lakha Khan accompanies his song with the sarangi, a compact bowed instrument with three fingered strings and an array of sympathetic strings. He is joined by Papamir on dholak, a double-headed drum whose different-sized ends between them mimic (to some degree) a pair of tables. From the Sarangiya Langa tradition, Kadar Khan also accompanies himself with the sarangi, being joined by Noore Khan who also plays sarangi and contributes vocally. Both of these traditions are particular to their respective places, whereas the third tradition represented by Bhanwari Devi, is peripatetic or itinerant. She sings to the accompaniment of a hand-pumped harmonium played by her son Krishna Kumar and the dholak played by her son Indra Chand. Her voice is astonishing in its blend of clarity, power and warmth, and also its tessitura. Papamir also joined Bhanwari Devi, and as the performance developed it was delightful to watch he and Indra Chand develop confidence in their rapport so that by the final number, to which all the performers contributed, there was a distinct synergy in force to round off what was a real privilege of an occasion to witness.